China's investment in overseas infrastructure has expanded during the past five years from connectivity and energy to industrialization, with a notable growth in the buildup of soft infrastructure, a Chinese expert said over the weekend. Since 2010, the overseas assets of centrally administered State-owned enterprises (SOEs) have grown at an annualized rate of 15 percent and their operating income grew at 4 percent each year, according to a statement on the website of the State-owned Assets Supervision and Administration Commission (SASAC) in June. The statement noted that these companies have set up overseas subsidiaries in 185 countries and regions. The scope of business has expanded from engineering projects, energy and resource exploration to areas such as high-speed railways, nuclear power, telecommunications and grid network construction, said the statement. Liu Ying, a research fellow with the Chongyang Institute for Financial Studies at Renmin University of China, said centrally administered SOEs are part of the backbone of China's overseas infrastructure expansion, and countries and regions joining the Belt and Road initiative are the main destination. "In addition to ports, roads and pipelines, there are more than 100 overseas economic cooperation industrial parks and cross-border economic cooperation zones globally. To allow these parks to function, usually it is the Chinese companies that lay down the infrastructure," Liu told the Global Times on Sunday. The Chinese infrastructure projects also invite the participation of local companies and third-party countries. "The China-Pakistan Economic Corridor, for instance, involves the participation of UK firms. It helps to contain risks and makes success easier," Liu said. China Railway Construction Corp (CRCC), one of many central SOEs to have invested abroad, said in a statement e-mailed to the Global Times over the weekend that China's engineering capacity has won worldwide recognition in terms of scale, quality, technology and standards in the past five years. "With more and more 'Super Projects' going overseas, Chinese technology, solutions and wisdom are being offered to the world, and this will benefit people and boost cooperation," the company said. During the past five years, CRCC has conducted business in 116 countries and regions. The company took part in the construction of the Haramain High Speed Rail project in Saudi Arabia and the Ankara-Istanbul Railway in Turkey. 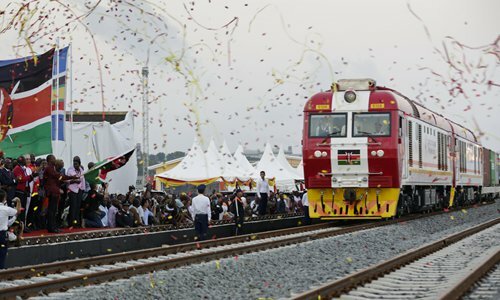 It also completed the Addis Ababa-Djibouti Railway, the first electrified railway in Africa to use Chinese standards across the whole industrial chain, CRCC said. The company has more than 60,000 overseas employees, only 10,000 of whom are Chinese, the company said. CRCC said that the volume of its foreign projects increased from $11.4 billion in 2014 to $18.8 billion to date, and the company's Fortune 500 ranking has also risen to 58 from the previous ranking of 111. State-owned China Communication Construction Corp (CCCC), a leading company in the infrastructure and engineering sector, said in a statement sent to the Global Times last week that it has engaged in more than 200 projects along the Belt and Road route totaling over $50 billion. These include Sri Lanka's Colombo Port City, Pakistan's Gwadar Port and the Mombasa-Nairobi Standard Gauge Railway in Kenya, CCCC said. For the Mombasa-Nairobi Railway, the company is in charge of the operation and maintenance, CCCC said, noting this has set up a new model for China's railway technology exports. CCCC has so far built 10,320 kilometers of roads, 152 bridges, 2,080 kilometers of rail road, 10 airports, 95 deep-sea berths, and created about 100,000 local jobs, said the statement. Liu said China is offering an integral approach in boosting trade and investment. "China wants to do business with its neighbor, so it helps that neighbor to build a road first. The focus is not on making a profit with that road; the focus is on what's coming after that," Liu said. "Infrastructure is the first step, and it will be followed with trade and investment and industrial cooperation. Efforts to facilitate trade and investment also matter and soft infrastructure improvements such as bilateral agreements on boosting customs clearance and newly opened air links have also increased over the past five years," Liu noted.